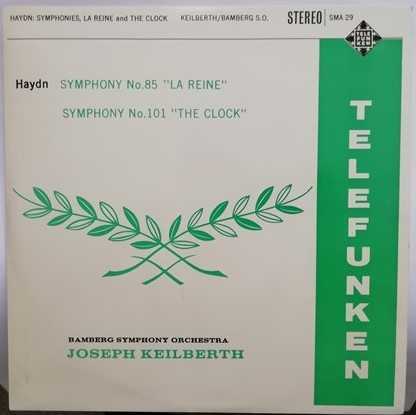 33rpm LP Record of SMA 29 Haydn SYMPHONIES LA REINE AND THE CLOCK featuring the Bamberg Symphony Orchestra conducted by Joseph Keilberth. 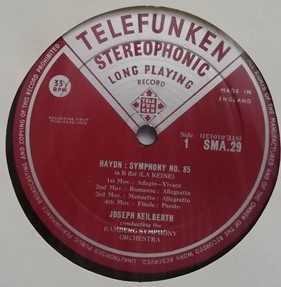 It was issued on the Stereo Telefunken Records maroon & silver grooved label in 1960. UK pressing. The record itself is graded excellent, with no more than the odd light non-feelable surface mark visible under normal domestic lighting. Play-tested on a USB turntable. Superb sound quality, with NO jumps, repetitive ticks, or crackle and just an occasional light pop. Hardly worth mentioning. 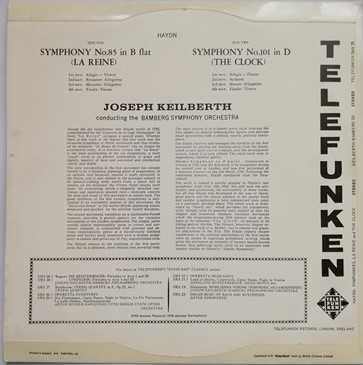 Basically, stunning faultless playback for a record that is nearly 60 years old! Minimal to no spindle wear. Labels clean. Faint spider marks. The outer sleeve is graded at least excellent with no more than the very lightest handling and storage wear. The thin spine is intact and strong. The inner sleeve has no wear to speak of. Superb!